This is my favourite part. I exfoliate my whole body usually everyday (not my face) as it makes me feel very clean. It also helps to get rid of that dead layer of skin that makes us look dull. I also unfortunately suffer from a lot on ingrown hairs, especially on my legs, and exfoliating every day helps to release them and stop bumps appearing. 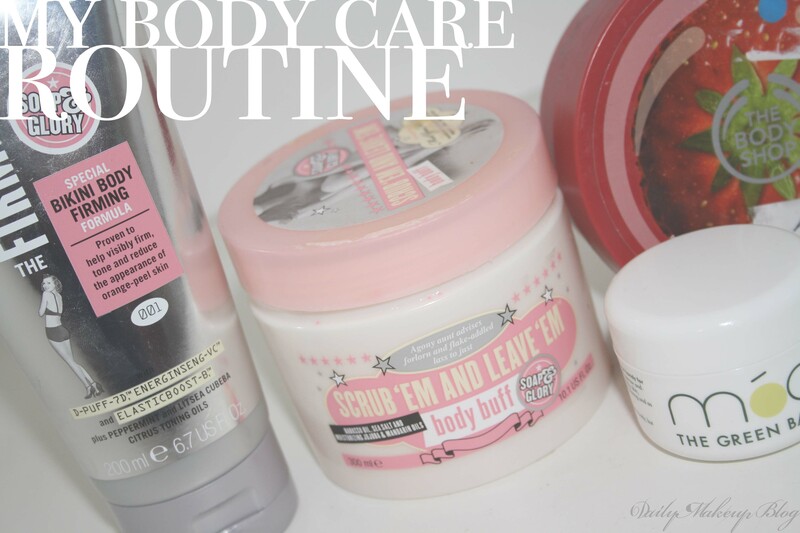 My Favourites are any scrubs from Soap and Glory, they smell amazing, and worth amazingly too! This is a hugely important step that most people ignore. I moisturise my body every day, and you should, or at least a few times a week. We seem to take so much care of our faces, and then neglect our bodies! I love the Strawberry Body Butter from The Body Shop. It is so thick and intensely moisturising, and smells incredible. I do only recommend this for at night though, as it takes a while to sink in! Instead of just using a body butter after removing any unwanted hair, I use this product instead. This is Moas ‘The Green Balm’, and it is a really thick healing balm which is great to help your skin recover, from either shaving, waxing or creams. I like to use a firming cream on my thighs in both the morning and at night. I just think that if there is anything extra I can do to help my body be firm, I will do it! I am currently using and really enjoying the ‘Firminator’ by Soap and Glory.